CER Jess Be Nimble ’s dam Painted Bug SI 113, a daughter of the great Shawne Bug had 17 wins from 2-5 earning $274,569. She is the highest earning daughters of Shawne Bug and the greatest producer. Painted Bug is also dam of Strawberry Silk, winner of All American Futurity, LTE $1,266,263. Strawberry Silk is the dam of Stoli SI 99 LTE $332,327. Shawne Bug horses are also well known in the barrel horse world with him always being in the top sire list as well as being a top maternal sire. Shawne Bug SI 101 is also the sire to multiple NFR qualifiers in barrel racing. Not to be outdone by his bottom side, Cer Jess Be Nimble is an own son of Mr Jess Perry SI 113 LTE of $687,184, Champion 2 Year Old, Champion 2 year Old Colt, and Leading Sire of Money Earners, Stake Winners and Stakes Wins in 2008 Mr Jess Perry has produced barrel horses himself and sired, barrel horse sires including Feature Mr Jess SI 101. He has progeny earnings of over 42 million dollars. Jess stamps his foals with good looks, correct conformation and easy going dispositions. 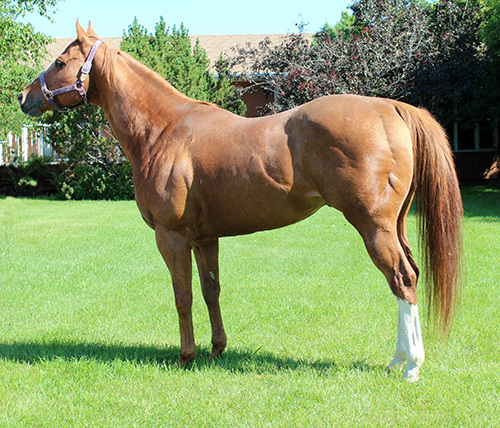 One of his first foals to race was Hunters Cer Nimble SI 90 who won $24,881 and is now ridden by a youth barrel racer. Sierra Booth was 6th in the CBHI Super Stakes barrel race in 2014 on the race winning mare BDB Addie Be Nimble LTE $17,430. BDB Jess Fast is currently running in the 1D with many up and coming futurity horses to make waves in 2015. Stud Fee: $1500. Considerations to proven performers and/or producers. There have been several great Cer Jess Be Nimble colts hit the barrel pen and we are very proud of all their success. If you have videos of your colts, please send them, we’d love to see them. Here is BDB Velocity and Kathy Brown who had a great futurity year in 2016.